My sister lent me this book and I also found it interesting, although the underlying themes she understood from it were somewhat different to my view; however there was a lot there to ponder on. I did find it slightly depressing - but for all the wrong reasons! It wasn't the desperate nature of the lives of the individuals that upset me, but rather, once again, merely the description of architectural vandalism. Waxwings themselves (birds) are never mentioned until the last page of the book. The author says: "...it seemed perfect as an analogy for what people were doing with Seattle during the dot-com movement: these birds, as it were, migrating from gold rush to gold rush, getting high, falling out of the tree, waving their feet around, getting up, moving on." Yet another really interesting Robert Ryan adventure story. 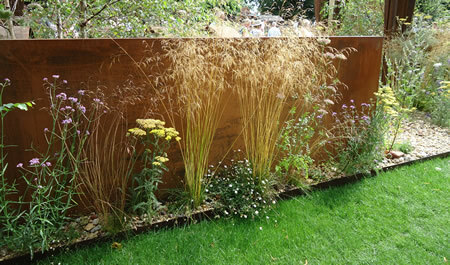 It's all about T E Lawrence "before". I always felt that, however wonderful the 1962 film with Peter O'Toole, (and it was wonderful), it made it seem as though Lawrence ended up leading a fighting force of Arabs on to an amazing victory by sheer chance. This book - to whatever degree it might be fiction - provides excellent insight into why and how he went on to such legendary exploits. It also provided me with a lot more understanding of the politics of the time in the more easily digestible form of a Boys Own adventure story. 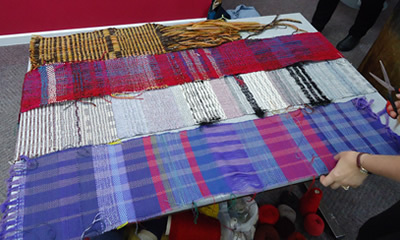 These are the pictures of the class weavings. Sadly no group photo this year, even though I met some great people - and also met up with some people from last year who were at Cottenham on other courses. We did manage a group outing to a local artist's open house, followed by a meal in one of the many restaurants on offer in Mill Road. 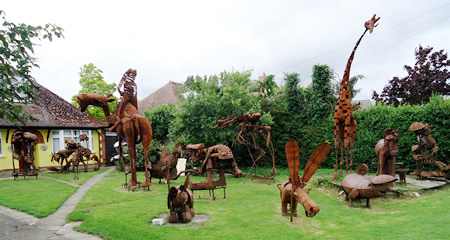 On my way commuting to Cottenham, I passed these great metal sculptures every day, and today - my last opportunity - I stopped to take a photo. apparently they are the work of Tony Hillier, who, astonishingly does not sell his work but will undertake commissions for public places. 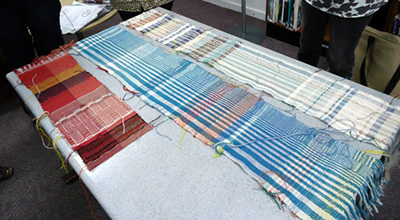 Today it was time to "get weaving". 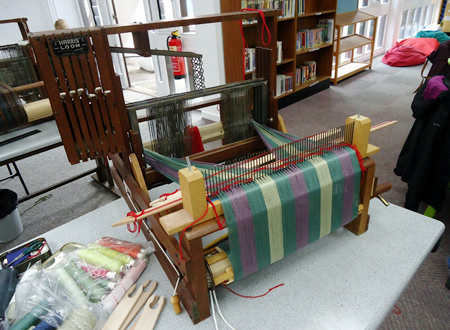 Here is the loom - back and front - with the warp put to rights. Having spent yesterday on general introductions and so on, today I got down to working on my loom. 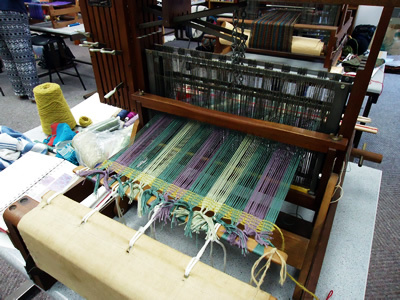 I prepared the "warp of many colours" on the frame and then transferred it to the loom. 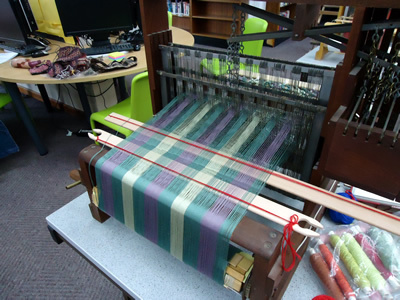 The photo shows my warp threaded through the raddle. Only 2 "deliberate" mistakes here. One is I casually referred to my loom as having a 16 inch working width and it turns out it has only 15 - which meant my "ends per inch" calculation was all wrong and I had to redo the work with the raddle. The other is that I ended up with the warp wound on the front beam - which is a plausible method of working but was not my intention - so I had to transfer it. The university has a "Shakespeare Festival" in July and August and I took the notion to go. I had not planned for it to be this evening but looking at the weather (which is lovely but unpredictably showery) I decided to rush off there and then to the Kings Fellows garden - clutching my picnic and an anorak - for "Much Ado about Nothing". Here I am again in Cambridge having signed up for Anna's weaving course (again) - this time with my own agenda for starting a project on my loom - under careful supervision! 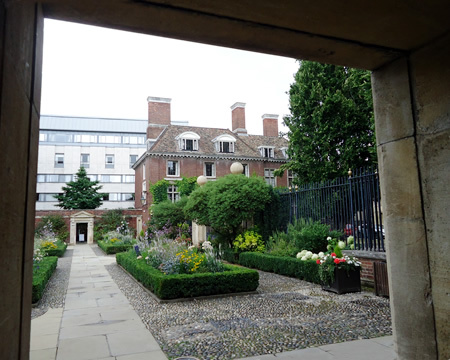 After having had the idea last year, I decided I would like to stay in one of the Cambridge colleges - my alter ego kicking in: "a student who accidentally got a job". Cambridge is pretty unfriendly to visitors with cars, but despite that (and with some reservations) I decided to stay right in the city. Tempted by Sidney Sussex, but in the end I went for St Catherines as the accommodation on offer for my dates was on site, and not in a modern student block. My concerns about parking and driving were not unwarranted, (I committed only 2 violations that I'm aware of though the signs seem to make the rules a complete mystery! ), but overall parking was a bit easier than I imagined as I was able to leave quite early in the morning and return after 6:30pm. Catz was great and I would recommend it to anyone. 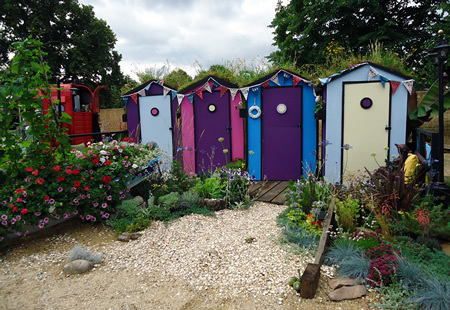 I had a shared bathroom, (which worked out fine), and the room was spacious and secluded with a pleasant view of the garden courtyard; the food was excellent - breakfast was included but an evening meal was also available if required. So here is the benefits of belonging to a Guild: you get a group effort to help you unravel your blank ready for knitting. 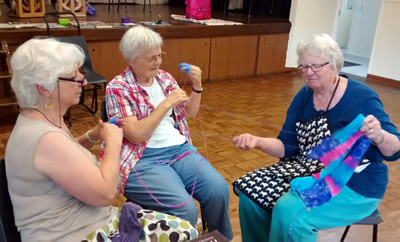 you are sitting peacefully knitting, surrounded by a comfortable tangle of yarn, when your friends descend on you and take over with frenzied activity - at the end of which you continue peacefully knitting, with 2 balls of wool which are firmly under control. George's verdict from lat year ["it wasn't as bad as I expected"] meant he was keen enough to take another trip this year. It did mean we spent more time looking at lawn mowers than I might have done otherwise, but overall was quite fun. I bought rather a lot of lavenders. 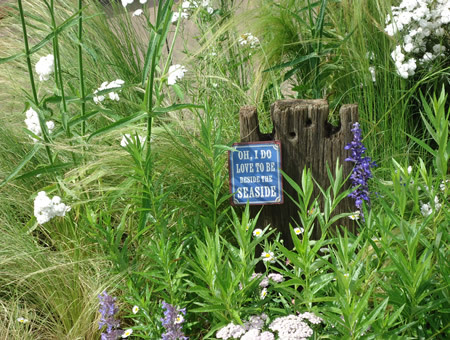 The gardens were lovely and of course these seaside gardens were the ones that I loved the most. 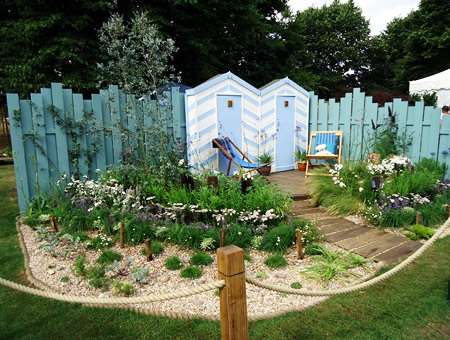 Both of these gardens were built by young offenders from Southend who are trying to get back on their feet. Aren't they perfectly lovely? After the opening chorus I began to think this was a huge mistake. I booked the tickets through a nostalgia for the Wind in the Willows production at the NT in the 1990s and of course it did not bear comparison. However that was my own stupidity as this quickly won me over, being something of a kids pantomime - with the usual clever jokes on two levels for both kids and adults. Rob commented at the interval that it was "utterly charming" - and he was very smitten by the costumes (as was I) since they were not so much dressed as animals but more wearing artistic representations of their characters. Rob and I spent the day in London. He was keen to see the Pink Floyd exhibition - so we were at the V&A for its grand opening of the new entrance in Exhibition Road (and we duly used it). 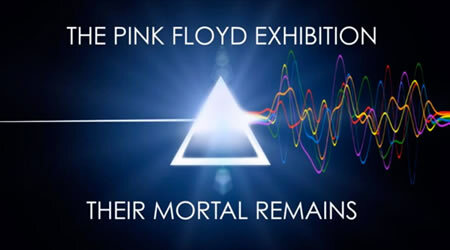 The exhibition itself demonstrated a fantastic use of multimedia - well the subject rather lends itself to it - and I think it's actually worth spending more time on it than we did (which we could as I joined as a member while we were there). Rob however was strangely less impressed; I think it's perhaps because he has been such a fan through all that time of Pink Floyd's existence, he was somehow expecting "more" - when in fact he probably has seen, heard, and done it all already. Rather excitingly (!) 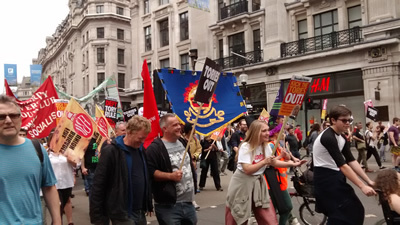 on the way to our next appointment at the London Palladium, we were able to join in with a protest march. 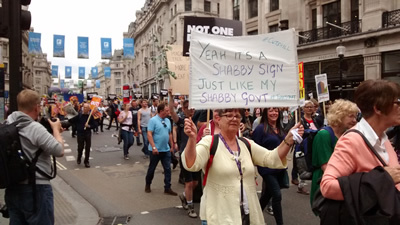 It quite took me back.... and I think the same could be said of a number of the other participants - I felt quite at home with them all.